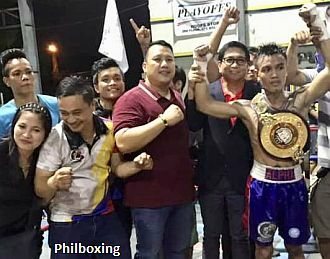 Filipino Alphoe Dagayloan (11-2-5, 5 KO's) impressively stopped strong Chinese foe Rongguo Wu (6-2-2, 2 KO's) in the 6th round to capture the vacant WBA Asia East Flyweight Title Saturday (Oct 27) at Quibors Boxing Gym in Bacoor, Cavite; a victory that might get the Dipolog native into the world rankings. Fresh from a prior knock out win overseas, Alphoe Dagayloan, 26, overpowered the brave Chinese with rough, sharp combinations to the head and body, that prompted the demise of the Middle Kingdom warrior in a fight supervised by GAB Boxing Division Chief Dioscoro B. Bautista. In his last combat, the tall southpaw Dagayloan spectacularly stopped unbeaten Kazakhstan fighter Madiyar Zhanuzak in eight rounds in Russia; and now the protégé of promoter Joseph Quibral wants more tough challenges. Thrill of Victory. 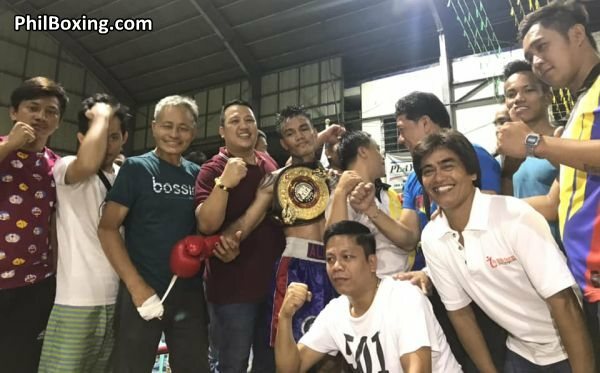 After knocking out the Chinese, the new WBA Asia East Champion Alphoe Dagayloan celebrates with team members and fans Saturday in Bacoor Cavite. In the co-main feature, 20 year-old "Amazing Boy" Francis Jay Diaz (7-1, 2 KO) of the Quibors Boxing Stable scored a round 7 stoppage win over experienced Boholano Powell Balaba (9-27-1, 5 KO's) of the Elorde Gym to claim the Luzon Professional Boxing Association (LUZPROBA) Light Flyweight Belt. The exciting battle was halted due to a severe cut on Balaba, 29. The cut was a product of an accidental headbutt occurred in the heat of the action. Ahead on point was the "Amazing Boy," earning the triumph by stoppage in seven. The younger "Amazing Boy" proved to have enough boxing and power to deal with a more tested man as Powel Balaba, in the process winning his first belt in boxing. In supporting battles, more accomplished Batangas welterweight Roberto Gonzales (29-4, 17 KO's) won a 6-round unanimous decision over unheralded, ten-pound heavier Edsil Jungco (3-12-6, 0 KO's) of Iloilo. With the win, Gonzalez comes back to the winning circle. The fight referee was renown architect Elmo Coloma. In flyweights, newcomer Elmar Zamora (2-0, 2 KO's) overpowered game Mark Henry Escriber (1-2, 0 KO's) of Bulacan, scoring an impressive round 4 TKO win. The third man was again the elegant Elmo Coloma in another flawless ring performance. Plus, super flyweight Arlon Batingal (8-9, 4 KO's) of Compostella Valley outclassed with good boxing Cagayan de Oro native Julius Bala (4-11, 2 KO's) for a 6-round unanimous decision win. Billed as Bakbakan Sa Molino Part 9, the exciting fight card was a production of active promoter Joseph Quibral of Quibors Boxing Promotions in association Gerry Balmes, manager Orlando Borcelango and matchmaker Jimmy Vallares Jr.